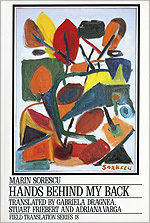 "If anybody, except a poet, were saying the things Sorescu says in his poems, he or she would be found insane. But this is what poetry should be doing, putting this kind of material into rational form." "This selection, which includes poems from all stages of his career and translates them into a suitably American grain, opens the border wider: American readers now have direct entry into one of the most cheering and distinctive regions of the contemporary poetic imagination." "Sorescu has the ability to say, once or twice in a poem--though God knows even once is enough--something that causes a transfiguration of the whole piece. That one moment, which changes everything, if it were to be severed or disentangled from the rest, might actually seem somewhat slight--but in context, surrounded by that strange, oddly prosaic or matter-of-fact voice, it causes something miraculous to take place." Is to get used to your name. Your name's no longer a problem. An interval will set in. Costmary, zephyr--or all these together. Like a top among stars. Copyright c 1991 by Oberlin College. May not be reproduced without permission.